Get the PDF of OGL Steampunk from RPGNow or the original book from Amazon. You too can earn money from writing articles by signing up for InfoBarrel. 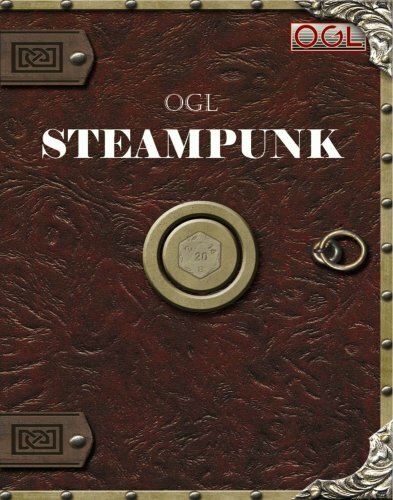 OGL Steampunk is a role playing game supplement by August Hahn and published by Mongoose Publishing. The supplement is covered by the Open Game License, which is what the OGL in the supplement's title stands for, and is based on the Dungeons & Dragons game, of at least D&D 3.0, although it is intended to be largely a system in itself, rather than a supplement for other game systems. It should be comparatively easy to adapt it to other, similar, d20 based systems though. The version reviewed here is the PDF version of the supplement. It isn't available in print on demand, but copies of an older hardback print version can still be found. This is a 306 page black and white PDF with colour covers which is available from RPGNow. Two pages of the supplement are the colour front and back covers, one page is the front matter and table of contents, one page is the Open Game License and four pages make up the index. The rest of the book consists of the Introduction and eight chapters. Throughout the book, starting in the Introduction, a story is told about a group of adventurers out to sabotage an orc construction. Each snippet of the tale is related to something covered in the text of the book near to it, providing a fictional representation of how the mechanics work. Credit: Mongoose Publishing/Scott ClarkThe Introduction covers the concept of steampunk and how it has affected magic and the world, as well as what a role playing game is, what you need in order to play one, and OGL Steampunk's basic rules and concepts, which will be used throughout the book as the basis of the game mechanics as well as descriptions of what various things are, such as class, race, player and non-player characters. The first main chapter, Character Background, covers creating a character, generating abilities for them, background points and what they can be used for, races, which, along with various standard races, also includes several new ones related to the steampunk era technology, such as C.o.G.S (Creations of Generated Sentience) and Hybrids, the latter being human/animal hybrids, and the various undead races. Also covered are a system called allegiances, which is where a character pledges allegiance to a person, group, organisation, nation or cause of some type, and other related facets of a character having nothing to do with their class or vocation. These are covered in the next chapter, Classes & Vocations. Various different classes are detailed, as well as vocations, which are specialities within a particular class, as well as how to handle multi-classed characters. The various class features, including skills, talents and feats, are also mentioned, although these are fully detailed in later chapters. There are a lot of new classes and vocations in this chapter, which is one of the largest in the book. The classes and vocations are described in a manner that should be familiar to those who have used other similar systems, such as D&D 3.5 or Pathfinder. Skills covers using skills, how to acquire ranks in them, how to check them to see if they are used successfully, and what other factors may affect the use of a skill, or how they can be used to help others, before finally describing all the skills themselves. As with the previous chapter, these are all laid out in a fairly standard way, and cover traditional skills as well as many new scientific and weapon skills that would be needed in a steampunk setting, as well as some related to how magic is covered in OGL Steampunk. The next chapter, Feats & Traits, covers feats of different types, both regular and occult, that can help make a character's life easier, including those needed to manufacture things, especially those new to the setting. Traits are various abilities tied to particular races, laid out in trees, where later traits require earlier ones to be acquired first. Again, these are all described in a fairly standard way. Equipment & Wealth has some differences to how wealth is normally handled in role playing games. Instead of players having a specific amount of money, they instead have a wealth bonus, which can increase or decrease, which determines what things they are able to buy, by performing a Wealth Check - similar to a normal ability roll - to see if they successfully buy something. How the wealth bonus increases or decreases is also covered. The rest of the chapter covers those things that players can buy with their wealth, including armour, weapons, equipment, clothing, food and lodging, services, transportation and vehicles and entertainment and leisure, as well as how they may break or malfunction, if appropriate. A World of Adventure covers the mechanics of adventuring, including such things as traps (including how to design them and some examples), actions and combat, as well as healing, all of which are fairly standard for comparable systems. More different is the vehicle rules, including combat, as this may be between steampunk powered machines. Other typical adventuring concerns such as carrying capacity, darkness and light and disease are also here, as well as newer ones such as electricity and three dimensional movement. Much of this chapter is pretty standard, and it also includes how to award experience and determine challenge ratings and encounter levels. The Power of Steam focuses on the "steam" part of the steampunk setting, although devices may be powered by things other than steam. Science in general and in specific is covered, and there are extensive rules on how to create what are called Amazing Machines, which can be of many different types, from personal weapons to structures, and can have many new abilities. The Occult is one of the areas where OGL Steampunk is the most different to a standard system. The Occult is divided into psychic phenomena, which essentially is psionics, and magical rituals, which replace the standard magic system, and how to create items related to these. The magic system is divided into new areas and types, and how magic is practices is different too; this is explained as being the result of the influence of science. Various different psychic abilities, as well as how to perform magical rituals and the various different effects that can be achieved. These can then be combined into rituals, and how to create these as well as some sample ones are described. How to adapt spells from a more standard system is also covered. The cost of the supplement was $4.99. As this was originally a print version, the PDF lacks any bookmarks. This, combined with a table of content which only covers chapter titles, makes this not the easiest PDF to navigate, although it does have a full index at the pack. The quality of the covers is poorer than the rest of the book. When they are viewed at 100% magnification - normal size in other words for a PDF - the text on them is blurred. The interior of the book has the occasional illustration in black and white, as well as black and white page edging graphics - the latter will greatly increase the amount of ink needed to print the book out. The impression is given that OGL Steampunk is a system in itself but truthfully the supplement does not really stand by itself, and other material is going to be needed, which means that publications from other companies will need to be adapted. Although there is a lot of content, such as classes, and their related skills and feats, races, items, technology and magic, there is no bestiary, despite multiple references to orcs in the story that runs throughout the book (said story being quite useful at illustrating what is being covered in the book). There is some information on adapting spells from other systems, but that's the only case where that happens. Monsters from comparable systems could probably just be slotted into an OGL Steampunk campaign, but the book itself is not really sufficient for running an entire campaign on its own. There are a number of interesting concepts in the supplement. In particular, the section on amazing machines could be adapted to another system, and provides all sorts of potentially interesting, or dangerous, equipment for characters to come into content with. Adapting the book to existing worlds will require a lot of work, and possibly the removal of some of the material, in particular anything related to The Occult section. The alternative is creating an entire world, which can be more work than many GameMasters actually have time for. OGL Steampunk, despite the level of detail it goes into in some areas, is probably better treated as a resource, where you pick and choose what is wanted from it, rather than the entire base of a system that it appears to have been designed as, but the comparatively low price for the PDF does make it relatively inexpensive to pick up and use as a resource..